I hadn’t planned on putting in my two cents on this fall’s diverse crop of pilots, but thanks to iTunes’ generosity, I have the pleasure of writing about what is surely this fall’s most adventurous new show: Fox’s Sleepy Hollow. While this show certainly seems (and is) quite cheesy, not to mention a bit gory and violent, the conceit and the sure-to-be compelling chemistry between the two leads makes this show promising. Taking The Legend of Sleepy Hollow as its source material, the pilot blends a fish-out-of-water story, gothic horror and suspense, and what hopefully will manifest into the smart and snarky back-and-forth dialogue police procedurals with which television seems quite literally littered these days. Opening during the Revolutionary War, we see former-Redcoat-turned-Patriot Ichabod Crane, played by veteran theatre actor Tom Mison, attempt to bring down a mysteriously immortal Redcoat soldier. After a violent tussle, he awakes in a cave and finds himself, disheveled and disoriented in modern-day Sleepy Hollow, a village in upstate New York. It seems that Ichabod and the Horseman’s blood have been mixed, binding their fates together. On the other side of the story is Lieutenant Abbie Mills, played by Nicole Beharie, a tenacious, no-nonsense young police officer with a supernatural secret of her own. When her partner is killed under mysterious circumstances, Ichabod is named as a suspect. Yet Abbie knows what she saw: her partner was slaughtered by a headless Horseman with a brand on his hand, dressed as a Redcoat. Through flashbacks and copious amounts of research, Abbie and Ichabod discover that this mysterious figure is related to the myth Four Horsemen of the Apocalypse, and from here we see a partnership bloom and form the basis of the show: Abbie and Ichabod must work together to take down the four Horsemen, deal with the warring witch covens of Sleepy Hollow, and address the inevitable apocalypse. Based on the pilot alone, this show seems like it knows how to juggle its various genres accordingly. I am not familiar with The Legend of Sleepy Hollow, so I am not the best person to judge how well the show integrates the source material into its new setting. 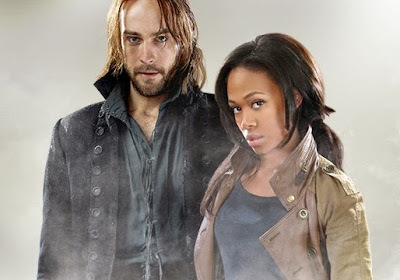 While certainly this first episode is driven largely by the need to build the world of Sleepy Hollow and to establish the overarching plot of the show, Ichabod and Abbie manage to have a nascent chemistry that hopefully will develop more intelligently than the clichéd “will they or won’t they” tension (as CBS’ Elementary pulled off spectacularly last year). Despite the overall feelings of foreboding and fantasy-horror, there is fortunately some room for humor, which derives mainly from Ichabod’s confusion with the modern world. Tom Mison brings both charm and gravity in what surely must be a difficult role. His eyes alone convey a bevy of emotions, while behind Abbie’s seriousness and dogged dedication to her work lies a certain vulnerability that I hope is expanded even further upon as the show progresses. It's also notable that Nicole Beharie is a woman of color in a starring role on a major television network, a feat which is sadly all too rare. Hopefully her role, like Mison's, proves to be rewarding and meaty as the show goes on. Of course, as with every pilot (and every show), there are certain aspects that don’t quite add what they should to the whole. The inclusion of Ichabod’s wife, Katrina (played by Katia Winter), a witch who saved his life via the blood-binding spell, is obviously necessary to the plot of the show. Yet the amount of focus given to her and her own mystical aspects, evidenced in a spiritual dream/connection with Ichabod hopefully does not portend that Katrina and the mythos involving the warring Sleepy Hollow Witch covens do not become too much of a focus. Already this additional element seems to be throwing extra intrigue into what is already a very plot-driven show. I also would have liked to have seen perhaps a bit more development of the peripheral characters; the intrigue surrounding John Cho’s fellow police officer comes too soon in the show and thus, we as the audience do not care about his actions in relation to his character and his relationship with Abbie—we only care that he does what he did for generic plot-twisty reasons. Similarly, Orlando Jones’ brusque, by-the-book captain is painted in the broadest of strokes, with his actions towards Abbie tinged by the slight atmosphere of horror—he clearly is not who he seems to be. I hope that as this show progresses, we learn more about the characters that inhabit the village of Sleepy Hollow and come to care about their actions. Additionally, while it is necessary for Ichabod to acclimate to his surroundings quickly in order to get the mystery and police-procedural aspect of the show going, he does become comfortable a mite too quickly. I hope that that future episodes maintain his fascination with and lack of comprehension of the modern world; if not, Sleepy Hollow is in danger of becoming too wrapped up in its elaborate mythos and will fail to be truly entertaining. Sleepy Hollow airs on FOX on Mondays at 9pm ET. I’d recommend downloading the pilot for free via iTunes, or trying to catch up before getting involved in the show. Based on the strength of its pilot alone, it’s worth taking a dive into this mysterious, eerie world. I did not watch the pilot but based on this review, perhaps I should. I love the way you give the positives and negatives and then a recommendation.... And you should read the Legend of Sleepy Hollow....its not bad for a ghost story from the 1820s....Nice Job! i guess it's time to read Sleepy Hollow. Can't say that I have though. Great Review. If I had time, I might check out this show.